NoScript - A Firefox addin that makes browsing safer. I think I've mentioned before that I run FireFox most of the time instead of Internet Explorer. One of the reasons I run Firefox is the wealth of addins that are available for it. If, like me, you run FireFox, I strongly recommend that you consider the NoScript plugin. Once you've clicked on "Allow ask-leo.com", or any of the other domains that can be allowed, scripts originating from those domains will be allowed and run from then on. Over time, after you build up your list of allowed sites, you'll rarely even think about NoScript unless or until you visit a site that is new, or has unexpectedly added scripting. This is where NoScript's real value comes into play: scripts from new sources will not run. Any attempts to perform malicious actions via scripting will not be able to take place until you've had a chance to determine if the site is trustworthy or not. With malicious attacks always seemingly on the rise, blocking scripting by default and allowing on an as-needed basis make a lot of sense. NoScript - another tool for your security arsenal. Why won't Flash work, even though it's installed? Adobe Flash is a nearly ubiquitous tool for displaying video on the web. You must install if, of course, but often that's not enough. One point about using NoScript. For the first few days it will be very annoying. Once you get the hang of it the add-on works great and is worth having. I use NoScript also but users need to remember that your allowed sites may have malware in the future. Only allow sites that you always use or need. If you are just reading a particular site then you want to consider whether you want that site to allow scripts. NoScript doesn't allow you to act foolishly on the internet. It is a tool that helps make it safer. I've read Google Chrome runs Java script in a sandbox and becauses of that is virtually safe from these attacks. Is that true? Also, many sites have several things that NoScript blocks. If the site doesn't work you have to enable them all or enable them sequentially to get things to work. Very time consuming. Sometimes you won't notice that some feature of the site isn't working because NoScript is blocking it and you'll miss something important. All in all, if you visit only mainstream sites I'd say the risk of infection because of a compromised site is not worth the trouble of using NoScript. However, if you regularly visit "iffy" sites then I recommend using it and being very careful about what you enable. JG makes a good point. Some users install protection and then negate it at every opportunity, rather like someone installing ZoneAlarm and then granting access to everything that asks for it. Punch enough holes in your defence wall, and it's no longer a wall, it's garden trellis! Thanks for the tip on NoScript. I'm a computer consultant (for 25 years), and always searching for something new or for a customer. I often have to remove junk that wasn't expected from some sites. Hopefully, this will cut down on the trash. I agree with JG: I have Firefox installed (though I prefer Opera) and NoScript. I thought NoScript great until I found how often I had to consider whether I could trust a site. One finds oneself allowing "all on this site" so frequently that it amplifies one's paranoia to the point of neurosis. I find that the (minor) annoyance of deciding which sites to allow decreases dramatically over time as it remembers the settings for all sites you've been to at least once. 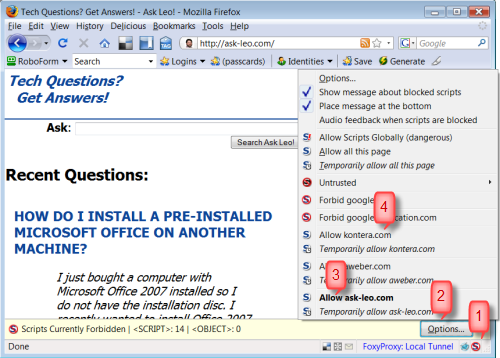 For example, NoScript lists for this very website four sites to possibly allow: ask-leo.com, pugetsoundsoftware.com, aweber.com, and kontera.com. Obviously, I want to allow ask-leo.com because that's the site I came to. But I don't know what the other ones are. I'm not saying they're malware; I'm only using them as an example. 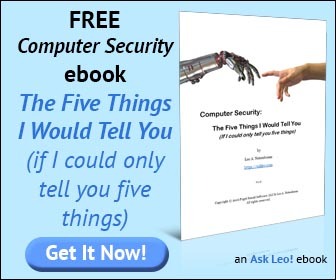 But as a web surfer, I only know that I want to allow ask-leo.com in this instance. I don't know what these other sites are and, if I allow them, would just be doing so blindly, negating the purpose of the add-on. I view it as a matter of trust: if you trust the site you're visiting, then it's probably reasonable to trust the additional site that it includes. This is most commonly advertising related but in many cases additional functionality as well. - pugetsoundsoftware.com is my corporate/parent site, and where I have certain scripts that relate to commenting, content management and spam prevention. 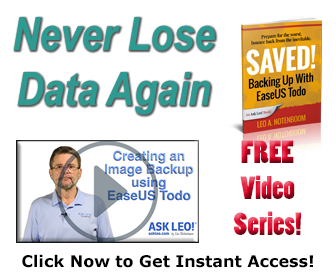 - kontera.com is an adverstising service that helps support the cost of running Ask Leo! - it's the one responsible for the double-underlined links in text. There are occasionally others like various google domains for site search, advertising and analytics. You don't have to enable them. The cost, of course, is that whatever it is they represent won't happen. You might not be able to comment, I might miss out on advertising revenue to help support the site, and you might not be able to search the site, for a few examples. So I go back to trust: if I trust the site I'm visiting, I typically allow that trust to transfer to all the scripting sites that it pulls in. If I'm not sure, I'll only allow the site itself, and enable others on a case-by-case basis if things aren't working. And of course if I don't trust the site - or just don't know - I trust, and enable, nothing. My website provider is btinternet.com and they provide a security service by McAfee. When looking at a website there is always a green McAfee sign to show it is safe to use or a warning when not to. How do you know that the other sites use Fire Fox and NoScript? You tell FireFox to trust your Bank, and the Bank accesses third party software to verify your identity, but the Bank does't use Fire Fox and NoScript. I just had an incident at work when I was online with the bank, and in my account, and reading their instructions on downloading my history to Money, etc. All of a sudden I noticed that my cursor was moving, and someone had taken over my pc; then I noticed that they had even changed from my account to another account. It freaked me out, and I immediately called the bank. They froze my account, and told me to call the fraud department. I called them, and they verified the secret questions on my account, and then said they had additional questions to ask me that was from a third party that they used which freaked me out. They wanted to know if I knew my Ex's wife, then how old she was, and her birthday. I could have cared less when her birthday was. Of course I didn't know. They told me that all of the answers were public information. They paid for access to all of this information. They asked me if I knew 3 foreigners whose names sounded like terrorist? They asked me if I new 259 S. Main Street, and I asked them which city and state. I use a bank on S. Main St, but I could care less what the street number is. I failed the test, and had to go into the bank to straighten out the mess. Can you believe all of this? They have not gotten back to me with an answer. My employer denies any problem on their end. How do I protect myself, when my employer has direct access to my pc to download upgrades to software, and to install new applications? Reading this makes me grateful for having Opera - i don't need an addon to get the same effect, it's already embedded in it from the start - in the Edit Site Preferences. I use WOT and Trend protect on IE8 to help me steer away from bad sites. WOT is community opinion and Trendprotect is an addon that looks for malicious script. They both don't always agree on giving the green light for a page but that's because they do different things. Last night I wanted to watch a movie on one of those sights that list several streaming sites that have the movie. I clicked on one of the sites to watch a movie and WOT listed the site in my tool bar as green which means it is safe as far as they are concerened. Then Trend also said that there were no malicious script on the page. So I'm trying to watch a movie and another web page keeps popping up from WOT saying that this site is not safe and that it has a bad reputation. The name of the site is different than the site I'm on. I'm not on this site it is listing. The site I'm on WOT has it listed as safe. Now that I have read this article and understand the third party scripters it all makes sense. I ran an online malware scanner after watching the movie because I recieved many a notice from WOT about a site I was not on. I went to sleep and when I awoke the scan had found 3 new adwares and 3 new trojans. So I would have to dissagree with you leo when you said if you trust the main site it's ok to allow the 2nd and 3rd party sites also. click on it, or right click and select always allow flash on this site. I love FireFox for the add ins too. Too bad those who provide them don't keep up with the FireFox release cycle, even though they have more than fair warning that a new version (4.0) is on the horizon (are you listening Norton Toolbar?!). I thought I would enable NoScript onto Firefox and when I tried to watch the video describing Noscript, it was blocked. So I disabled it. Duty now, for the future. Noscript, as with other programs like ZoneAlarm, are real boogers when you first start. Soon you will have it configured and goes unnoticed until....something out of the ordinary pops up. That's when it shines because it's doing exactly what it should do. While McAfee & WOT provides "green light-red light" assistance, you need to know why a site is getting a red light. Example w/ WOT: a site I've used for years [myway.com] w/o any problems was a red light. Why? It had a "smiley icons" link at the bottom of the page [never click this link- adware/malware]. That was it. The page itself was fine. WOT is just very careful. But as far as McAfee's "user based" input for site warnings, I found way too many false negatives for my liking. Sites I've used for years were cited as dangerous, although I never had ANY problem. Never. I just had comment on the above. The best advice while visiting a new uncertain site - don't click links that are not part of the main pages intention. Stay on the path brother & sisters - do not wander. It may be a good recommendation, but my recent experiences with Firefox and plugins have been very frustrating. With a new so-called version coming out every 30 days or so, trying to keep my favorite plugins and add-ons working with the latest Firefox is an effort in futility.